Frame and core: High quality extruded aluminum profile with 33mm flange width. Damper Frame and core: High-Quality Extruded aluminum profile with a natural aluminum finish. Black matte finish as an option. The frame and blades are of high-quality extruded aluminum profiled construction with the advantages of corrosion resistance and rigidity. Louvered type core is fixed to the frame with aluminum pins loaded with steel springs. The core can be easily removable and interchangeable to allow for maximum flexibility in installation, maintenance, and damper adjustment. The damper is fixed rigidly to the frame by aluminum rivets. Fixing by spring clips as an option. Damper blades are separated from its frame by nylon bushes. Opposed blade damper is screw operated from the face opening of the diffuser after removing the internal core. Lever operated damper as option. Discharges air horizontally in one way, either X or Y directions as per pattern arrangement. Foam gasket is sealed around the back of the frame as option to avoid air leakage. Available in rectangular sizes as option. Suitable for flush mounting inlay in type ceiling. Opposed blade damper is screw operated from the face opening of the diffuser after removing the internal core. Lever operated damper as an option. Discharges air in both the ways, either X or Y directions as per pattern arrangement. The foam gasket is sealed around the back of the frame as an option to avoid air leakage. The damper is fixed rigidly to the frame by aluminum rivets. Fixing by spring clips as an option. Damper blades are separated from its frame by nylon bushes. Discharges air in one way, equally in X and Y direction. Frame with multicore assembly discharges air horizontally in three directions. Frame and core: High quality extruded aluminium profile with 33mm flange width. Damper Frame and core: High-Quality Extruded aluminum profile with a natural aluminum finish. Black matte finish as an option. Optional diffuser frame stamped aluminum core. 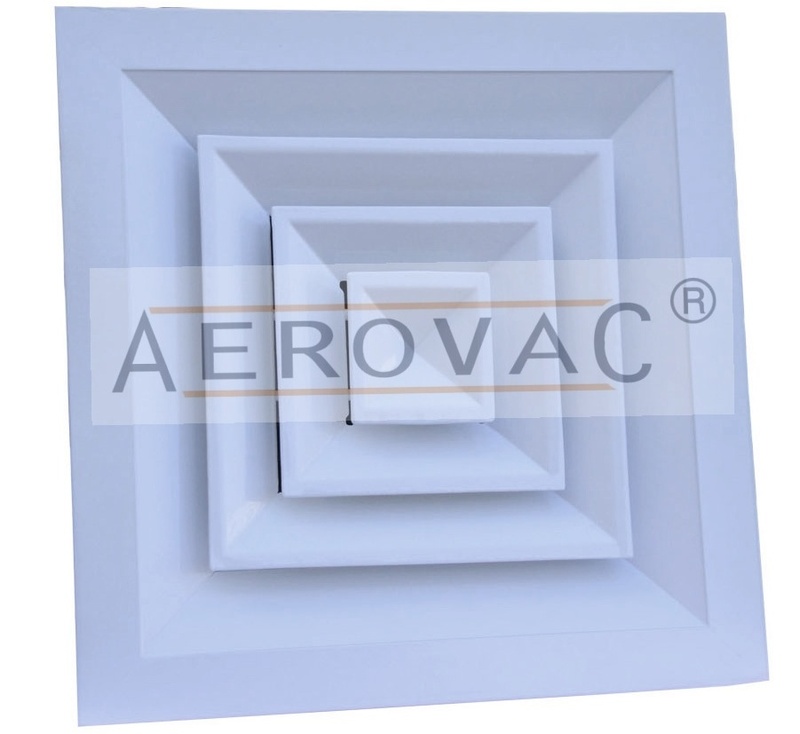 Diffusers shall be the coned type with each cone manufactured by extruded aluminum louvered profiles or one piece die formed aluminum construction – arranged in concentric cones to deflect air equally in four directions. Discharge air equally in four horizontal directions. Available in rectangular sizes as an option. Suitable for flush mounting inlay in type ceiling.